Van Shabu & Bar: Asian fusion and hot pot on the menu at new Dot Ave. eatery.Looking to satisfy your Asian cuisine cravings, get your fruit cocktail fix and watch the game? As of January, there’s only one place on Dorchester Ave. to do all three. Van Shabu and Bar on Dorchester Avenue near Savin Hill has become the local destination for Asian fusion fare and will soon be one of the few spots in the neighborhood to offer sushi. Karen Diep and her husband own the restaurant and sports bar, which opened in January to a very positive response. The newly remodeled establishment has a sleek and modern design, including granite tabletops and contemporary lighting. A full-service bar is one side, and booth and tables face opposite. 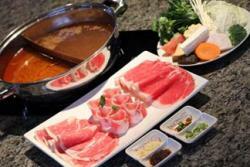 Some of the tables have a heated surface for the main attraction, shabu-shabu, or Japanese hot-pot. Diep says that locals have been receptive to the full-service bar and unique menu, which has something for everyone. From kid-friendly dishes to an Asian take on American appetizers, the menu has a diverse offering. Lunch time is busy, but the restaurant is still trying to draw a larger dinner crowd, she says. That’s why they’ve come up with a few more affordable options. The restaurant is holding more lunch and week night all-you-can-eat specials on hot-pot, sushi and oysters. “I wanted to create a fun menu with something for everyone to have, even kids,” she said. The drink menu was designed in the same vein. Standard mojitos, martinis and coolers are not what you can expect—the $9 cocktails are served with berries, sake and lychee fruit. The non-alcoholic selection contains a number of Asian-inspired beverages and smoothies. Even conventional sushi comes with a twist. The new sushi bar is slated to open next week and will feature rolls topped with mango, pineapple salsa and plum chili sauce, among several other specially crafted plates. Diep is no stranger to the restaurant business. Growing up in Boston, she worked in her parents’ restaurant across the street. The wide range of dishes comes from her background growing up with food from various Asian cultures, she says. Diep was born in Vietnam to Chinese parents. “I grew up around a lot of different Asian flavors. I’m a foodie,” she says. It is open Monday – Sunday from 11:30 a.m. to 11 p.m.